The subject of Christmas tends to be a slightly divisive one; most people enjoy the festivities and the occasion but there are of course those who dread the two month build up. Santa Surprise is definitely not for the latter but for those who like Christmas they now have the chance to enjoy the music and the experience every day. 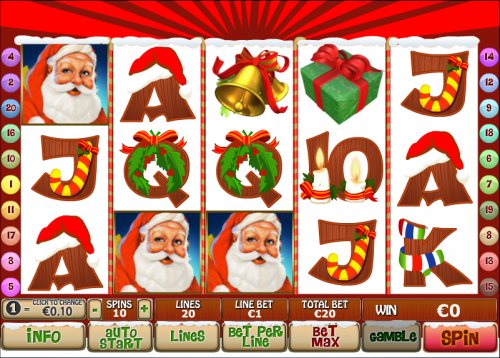 Santa Surprise is unashamedly Christmassy; there are five reels and twenty paylines and with Playtech‘s standard low value playing card symbols decorated in a Christmas fashion. Higher value symbols include a present, a stocking and a bell and the special symbols are a wild Santa, a snow-covered house as the scatter and a bauble-laden Christmas tree as a bonus symbol. To earn this reward you will need to land three or more Christmas tree bonus symbols on an active payline. You will then be transported to a room with six presents underneath a tree and depending on whether you landed three, four or five bonus symbols, you can pick three four or five gifts, each worth a cash amount. This proved to be the most valuable bonus feature for us and it’s triggered by landing three or more of the house scatter symbols anywhere on the reels in standard gameplay. You’ll now get ten free spins with a 3x multiplier. The good news is that spinning three more scatter symbols will win you more free spins infinitely. All slots fans love a gamble and each time you land a winning combo you can opt to double your money by clicking the ‘gamble’ button and trying the red/black bonus game. Your only task is to guess whether the next card drawn will be red or black; you can collect any winnings and return to the main game at any time but the limit to your winnings is €2,500. If you like Christmas then you should appreciate Santa Surprise; some seasonal music allied to a couple of bonus games and the gamble feature makes for a an entertaining slot machine.